d) TRAMWAYS AND THE GENERAL STRIKE: The General Strike of 1926 started on Monday, 3 May, and the support in Brighton was solid, the most complete of any town in the south. The railway engineering works were stopped completely, and by the Tuesday all transport services were at a standstill. Policemen were ordered to sleep at their posts, and a special reserve constabulary was sworn in to deal with possible trouble. The strike in Brighton reached crisis point over the operation of the tramways. With the council’s tramways committee considering the use of volunteer labour to take out the trams, about 2,000 strikers marched to the Town Hall to vent their feelings but were diverted away without a deputation being received. The following day a smaller crowd of about 200 gathered around the Town Hall. A woman driver, seeing the protesters, deliberately accelerated into them and injured several people. Without stopping she drove on, with police removing strikers from the car with truncheons, and she disappeared into the town. 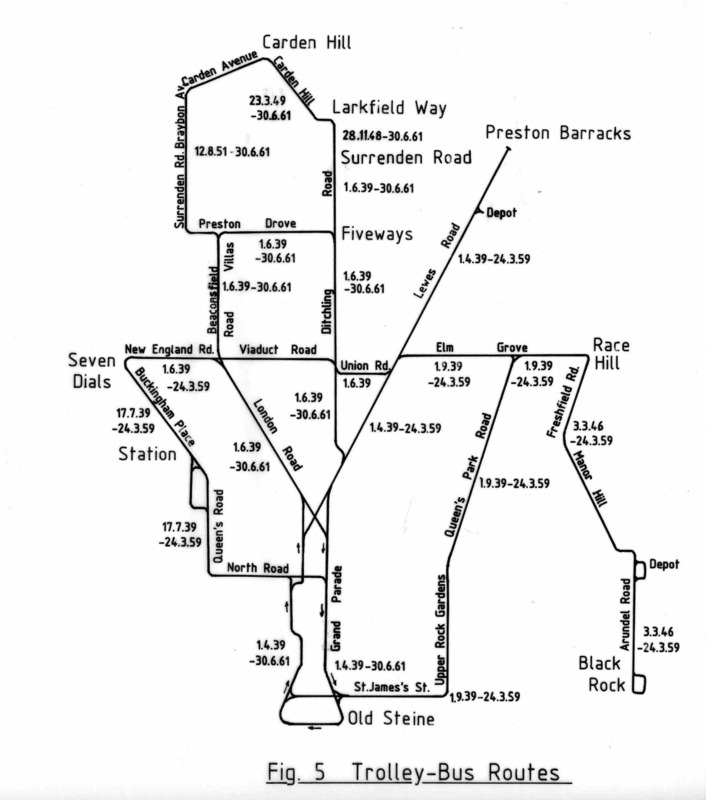 The dispute over the trams culminated in the so-called ‘Battle of Lewes Road’ on Tuesday, 11 May 1926, when 4,000 strikers gathered outside the tram depot in Lewes Road determined not to allow the trams to be driven out. Unknown to them there was no intention of bringing the trams out as the volunteers were only to be trained that day. Chief Constable Charles Griffin, with 300 men on foot and 50 mounted specials, ordered the crowd to disperse, but on obtaining no response ordered his men to advance on foot and then brought up the specials on horseback. As the crowd was driven back to Hollingdean Road some fighting started and the specials charged the crowd, lashing out with batons. As the strikers hit back so a vicious struggle ensued. Eventually the crowd, in which there were many children, was driven back and dispersed, but two people were left seriously injured and many others were hurt; seventeen strikers were arrested by the police and marched through the town to the police station at the Town Hall. That night there was another disturbance outside the Brighton and District Labour Club at 93 London Road when another five people were arrested. The next day all appeared before the bench and were handed severe fines and sentences of up to six month’s hard labour. The General Strike was called off the following day by the Trades Union Congress, an act which was seen as a great betrayal by many in Brighton. The special and regular police forces were given certificates by the council with the regulars granted three days extra leave, and a ‘victory’ parade of mounted specials outside the Floral Hall and a celebration dinner were held. A number of strikers were not reinstated by the management of the railway works and the bus companies, but the greatest resentment was caused by the action of the police and is still keenly felt by some old folk in the town today. 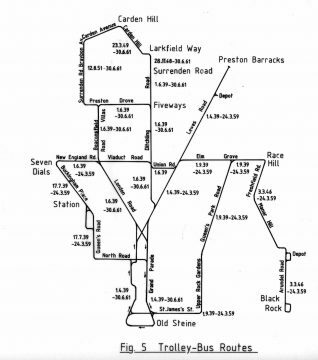 All routes (apart from C) started from the Old Steine (originally from the Victoria Gardens).